We're days from the Pretty Little Liars Summer Finale. To get you in the mood, we're taking Pretty Little Liars Season 5 Episode 11 to task in the following Round Table discussion. What is all this business with Melissa burying someone? 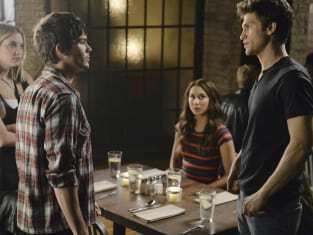 Did you believe Mona's sob story or care about Caleb's Ravenswood woes? Most importantly, who is going to die?? Join staff writers Leigh Raines, Nick McHatton, Teresa Lopez and Carissa Pavlica as they rip all of the best ideas to shreds and ponder the evidence for more brilliant theories. Join in and share your own thoughts in the comments! Why was Bethany Young in the same clothes as Ali? Does anyone understand what happened the night she was killed? Leigh: Bethany and Ali are related in some way, personally I think they are twins, maybe cousins perhaps. Bethany had mental issues and Mrs. D was hiding her so she referred to her as her aunt at the horse stables. Same clothes because she wanted to be like Ali. She probably hit Ali, Mrs. D buried Ali. Then hit Bethany in the head later, who Melissa buried. I mean this all makes ZERO SENSE. I think Ali getting hit that night had nothing to do with the rest of the Ali drama, but just family drama. Nick: I like Leigh's line of thinking here. The show is quickly running out of other viable options. Teresa: It looks like she was set up as an Ali decoy, but, no, I have no idea what happened that night. As the series goes on, more and more layers are added and I'm having trouble believing that so much could happen in one night. I mean the show can barely handle two things going on at the same time. Carissa: Honestly, Leigh's answer is as close to sanity as I've heard. Who the hell has time to dig holes and cover them up in that short time frame? Plus, Ali was rescued by Grunwald. How odd was it to go out to your freshly dug hole, see it covered over with footprints tramped into it and all disturbed only to dig it up to prepare for the body again? I mean, what the HELL? Are both Hastings sisters guilty? Leigh: Well Melissa is obviously. Ever heard of checking for a pulse? As for Spencer, it depends who hit Bethany Young. Nick: Melissa dropped a presumed dead body into an open grave and dumped sand over it. Guilty as charged. Spencer is not as clear, all season she's been painted as hating what Ali has cornered them in to, but is she truly capable of murder? Teresa: Spencer seems to think she's in the clear, but someone did bash Bethany over the head. It'd be a good twist for her to remember going back and taking a whack at someone she assumed was Ali. Especially after the show went through so much trouble to convince she was guilty of something. Carissa: Did Bethany die of lack of oxygen? What was her cause of death? If it was dirt inhalation, then Melissa could have covered her up alive, too, but it's more likely that neither are guilty of murder. Spencer bashed Ali, Melissa buried her and Grunwald saved her. No idea who dug the hole AGAIN, bashed Bethany and put her in there. Did you fall for Mona's sob story like Aria did? Leigh: Mona is crazy, yes, but I really don't think she hates the rest of the liars so much as she hates Ali. I think she has a side that loved Hanna and missed her. She might even actually like MIke. At the heart of it all, she's just a teenage girl. Nick: At this point, I believe Mona more than I do Alison, so I, like Aria, believe her. Teresa: Yes and no. She was tortured enough to wish for Ali's disappearance, but we should never forget that Mona was institutionalized for a reason. She has serious personality issues that make her slightly dangerous. Carissa: Huh? I don't even remember this sob story. Apparently unimpressed. Where was Ali this week? Leigh: In her lair, because she's totally working with A. I don't trust that girl for a second. Nick: I'm over Ali so much that I didn't even notice she wasn't on screen. She was referenced enough to feel like she was there. Teresa: Setting up her big finale. Honestly, the hour was probably improved without her constant whining, scheming, and manipulating. Carissa: Who cares? Any week without her is a win. Did you care about Caleb's Ravenswood tale? Nick: Not even a little bit. Fireflies? I've had enough of one cancelled show (Revolution) using Fireflies; I don't need another cancelled show to use them too. The shameless Ouija board promotion was just as terrible. Teresa: Do you mean the postmortem on Ravenswood or the big plug for the Ouija movie? Neither one. Not even a little bit. I'll say it again, Haleb deserves better. Carissa: It pisses me off that they took Caleb's entire season and squished it into a Ouija advertisement. That guy went through hell in Ravenswood. The least they could have done was show him some respect. Prediction time: Who dies next week? Leigh: Hanna seemed to be sobbing the most in promos. Maybe Mona? Some are speculating that she fakes her own death. Better not be Caleb!!! Nick: Who I want: Ali. Who'll probably die: someone I don't care about. Teresa: I'm guessing Alison, but she won't really be dead. Or, it could be Mona. Elicit some sympathy for poor Mona and then kill her off. It would look strange if more of A's minions were killed off. Carissa: The only way to save this sinking ship is to have Ali die for real. Let her terrorize people for the entire hour and die, leaving her dead like she was supposed be when the series started. 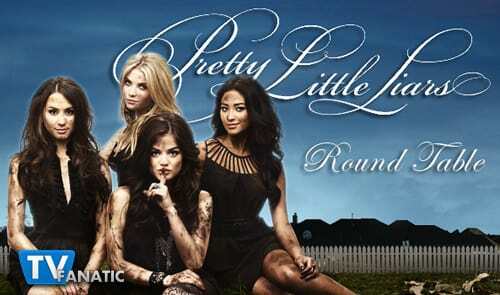 Don't forget, you can always watch Pretty Little Liars online via TV Fanatic when you want a fix!